Incredibly juicy, flavor-packed chicken and no BBQ grill required. Mix all ingredients for brine together. Place chicken and brine in a large ziplock bag and seal tightly. Give bag a good shaking to ensure brine reaches all areas of chicken. Place sealed bag in a baking pan to catch any liquid that may escape and place in refrigerator. Brine for 4-24 hours making sure to turn chicken bag halfway through brining. Make dry rub recipe- set aside (takes about 5 mins to make). Once chicken is brined, removed from brine and rinse well under cold water. Pat dry with paper towels. Pull the layer of skin back from one side of chicken and place exposed meat directly on dry rub. Replace chicken skin back over meat. Cover all sides of chicken with rub. 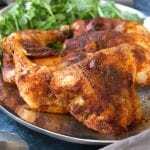 By placing rub under chicken skin, extra flavor will be infused into meat. Place rubbed chicken in two baking pans. Cover with aluminum foil. Bake for 50-60 mins or until chicken reaches an internal temperature of 165℉. *Please use as many organic ingredients as possible. * Prep time does not include brining time.